I like them the way they are. Very cute. No scarf – they don’t really have a noticeable neck. Just cute as they are. I think they look perfect as they are! I love to drop by and have a read whether it’s new or not ???? Penny they are great. I agree with fiddlyfingers, if you put a loop on black so it blends if they are not hung up. Wonderful! I love them as they are but they would look great with scarves or beanies too! Why not do some of each then they will take on individual characters! 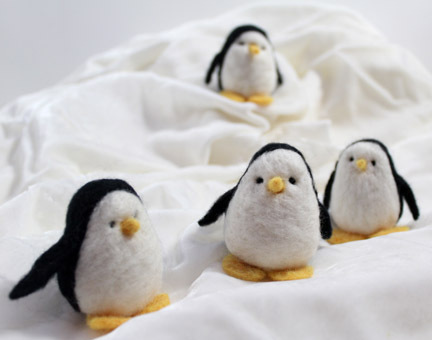 I sold penguins for years here – I’d say half with hangers and half without and I always had a needle and suitable thread to add one in an instant if needed:) I don’t think those need scarves either – they are really adorable just as they are! I think they are great as is! I also agree that a matching hanger would be nice. I agree with those that said – no scarves and option of with and without hangers. Great penguins. First thought is a scarf. So Penny, I would concur with most of your readers, no scarves. But i would say a matt gold hanger would look more splendid and festive. I’m sure they will sell really well. I think that although they are cute as they are, I would like to see them in a red scarf. Sorry. Thank you for a lovely easy to read blog.